A Nationwide ad showed a young boy riding a school bus and lamenting he'll never learn to fly, or travel the world with his best friend, or even grow up, because he died in an accident. The ad was aimed at stopping preventable childhood accidents. "At Nationwide, we believe in protecting what matters most, your kids. Together we can make safe happen," a voiceover said. Another ad by the insurer featured Mindy Kaling who thinks she's invisible because everyone treats her that way. But when she tries to kiss Matt Damon, she discovers that isn't the case. In case it wasn't clear, the idea is that Nationwide doesn't treat its customers like they're invisible. Budweiser's "Lost Puppy" ad was a winner before it even aired during the Super Bowl. The ad, which shows a puppy running away to find his Clydesdale buddies, already had 18 million views on YouTube ahead of the game. It's a tried-and-true formula. 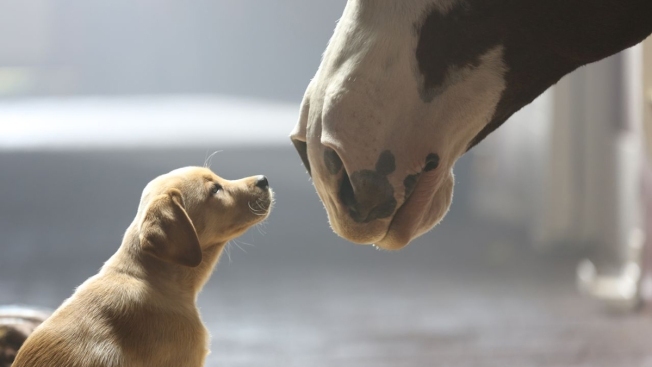 Last year, Budweiser broke records with its Super Bowl spot "Puppy Love," which was a Top 10 branded content video and Top 10 video overall on YouTube. Procter & Gamble is among the advertisers taking a more serious tone this year by addressing social or family issues. The company's 60-second ad for Always feminine products featured young girls upending the idea of what it means to do things "like a girl." It's a version of a previous video that had gone viral. By aligning themselves with feel-good causes, companies are playing it safe while hoping to engender goodwill from consumers. Chevrolet's ad "Blackout" appeared to be a live game feed that turned into static and a blank screen. But Chevrolet used the trick to show that its Colorado truck has 4G LTE Wi-Fi, so you could stream the game live in the truck. Then an Esurance ad showed celebrity Lindsay Lohan trying to pick up a boy from school. When he protests that she's not his mother she says she's "sorta" his mom because they're in the same age range and have seen a lot of miles. "When it comes to the big things (like your mom or your car insurance) sorta just doesn't cut it," a voiceover states. A second Esurance commercial starred Bryan Cranston as his "Breaking Bad" character Walter White, pretending to work as a pharmacist. Snickers scored some laughs early in the first quarter with an ad recreating a famous "Brady Bunch" scene. Actor Danny Trejo plays an agitated Marcia Brady with a broken nose, continuing the Snickers advertising theme that people aren't themselves when they're hungry. The kicker comes when the camera cuts to Steve Buscemi as he stands on the Brady's familiar staircase, reciting middle sister Jan's line of exasperation: "Marcia, Marcia, Marcia!" It's the ninth year Doritos is running its "Crash the Super Bowl" contest that gives fans a chance to create an ad for the big game. One of the two finalists aired during the game was "When Pigs Fly," which shows a boy designing a contraption to make a pig fly to get a man to give him a bag of Doritos. The other finalist, "Middle Seat," features a man scaring away potential seatmates on an airplane, then whipping out a bag of Doritos when he sees an attractive woman. As she gets closer, he realizes she's carrying a baby. The winner — who will be determined by fan votes and will be announced Monday morning — gets $1 million and chance to work onsite at Universal Pictures for a year. The runner-up gets $50,000. Dodge celebrated its 100th anniversary by sharing words of wisdom from people who are around the same age. Among the tidbits: "Keep your eyes open, and sometimes your mouth shut." In a not-so-subtle message to Verizon and AT&T, Sprint calls its two wireless competitors a not-so-nice word for a donkey — without actually saying the word, of course. The company writes a letter to its rivals that starts with "We apologize for calling you ..." and then shows a clip of a donkey. Then, it offers to cut its customers of Verizon and AT&T's bills in half. Carnival cruises aired its first Super Bowl ad, which featured an audio clip of John F. Kennedy expressing his love of the sea. Skittles, a first-timer to the big game, got some extra publicity early on when Marshawn Lynch popped some of his favorite candies into his mouth on the sideline. The Mars candy then aired an ad depicting a town where people, dogs and even babies have massively overdeveloped arms because differences are settled with arm wrestling. Toyota kicked off the ad games with a spot for featuring Paralympic medalist Amy Purdy snowboarding and dancing, set to a speech by Muhammad Ali that ends with: "I'll show you how great I am." Somehow, TV journalists Katie Couric and Bryant Gumbel seem to know what "twerk" means. The former "Today" show hosts poked fun at themselves in an ad for BMW's new all-electric car. The ad features a clip from 1994 when Couric and Gumbel express puzzlement over the concept of the Internet and the "at" symbol in email addresses. Fast-forward to present day, and they're expressing similar confusion about BMW's i3 car. Toward the end of the commercial, Gumbel asks Couric if she can twerk. "Maybe," Couric says. Nissan returned to the Super Bowl after 18 years with an ad featuring the story line of an up-and-coming race driver and his wife struggling to balance work and raising their son. On a jarring side note, the ad was set to "Cats in the Cradle" by Harry Chapin, who was killed in a car crash. Is Weight Watchers trying to make Super Bowl fans put down the guacamole and chicken wings? The first Super Bowl ad by the struggling weight loss company featured tantalizing food ads and marketing, an apparent illustration of the constant temptations facing dieters. The company says it wants to help people lose weight, but for some viewers, the ad may have just triggered cravings for more junk food. In Kia's ad, Pierce Brosnan is pitched a movie role in which he doesn't get to play the typical action adventure hero, which confuses him. Instead of dodging snipers and missile launchers, the role has him driving up a snowy mountain at 30 mph for a romantic getaway. First-time advertiser Wix.com showed retired NFL players starting fictional businesses after their NFL careers. Terrell Owens, for instance, starts a pie company, and Brett Favre starts a charcuterie business, Favre and Carve.